In social-ecological systems (SESs), social and biophysical dynamics interact within and between levels of organisation separated by spatial and temporal scales. The intrinsically cross-scale nature of SES dynamics and governance makes theoretical characterisation of cross-scale dynamics critically important, so that managers and stakeholders might better understand how the effects of measures taken at a given level will propagate across scales. 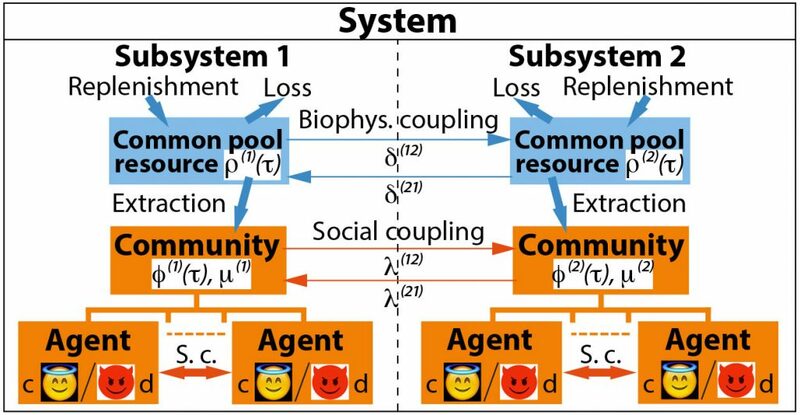 In this project, we are developing a stylised theoretical model of common-pool resource management by social pressure in a multilevel SES, accounting for cross-scale interactions (CSIs). We build on the work of Tavoni, Schlüter and Levin (TSL) (2012, 2016), who, using evolutionary game theory, modelled a community of agents harvesting a renewable common-pool resource. Agents adaptively choose whether to conform to, or defect from, a norm of socially optimal harvesting, enforced through social sanctioning. We are using this model as a building block to construct a multilevel hierarchy of communities with biophysical and social interactions both within and between levels. We are exploring conditions under which CSIs emerge between levels, and their implications for multilevel governance. Using a combination of numerical and analytical methods, our modelling framework can also accommodate other interaction mechanisms between subsystems, such as trade and migration, which will be added in future. It is also a basis for future development using multiscale analytical methods from many-body dynamical systems theory and statistical mechanics, which have successfully elucidated dynamics in many complex systems. We envisage that an effective theory of cross-scale interactions in SESs will provide an important complement to statistical and qualitative analyses from multiscale empirical studies. Intuition from this theory may guide empirical researchers in quantifying CSIs and the mechanisms underlying them, revealing new leverage points for effective governance of real systems. Tavoni, A., Schlüter, M., and Levin, S. ‘The Survival of the Conformist: Social Pressure and Renewable Resource Management’. Journal of Theoretical Biology 299, no. C (2012): 152–61. Schlüter, M., Tavoni, A., and Levin, S. ‘Robustness of Norm-Driven Cooperation in the Commons’. Proceedings of the Royal Society B: Biological Sciences 283, no. 1822 (2016): 20152431.